His Fair Assassin is a YA historical fiction series by Robin LaFevers, set in Medieval Brittany. The convent of St. Mortain is an order of women who are trained as handmaidens of St. Mortain, in the service of Death himself. Assassins, in other words, with a supernatural power to see a physical mark on those their god has chosen for death. I understand it’s going to be a trilogy. 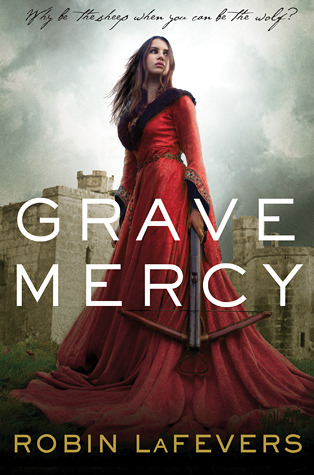 After escaping an abusive father and an equally abusive new husband, Ismae finds refuge at the Convent of St. Mortain, where she is trained as an assassin, carrying out the god’s justice in the service of Brittany and the realm. Handmaidens of Mortain dispense the god’s justice by killing when they see their victim’s marque, a shadow on the body. Ismae’s powers to sense death and speak to the recently dead give this a distinct spooky fantasy feel, and there is also a strong romantic storyline. I liked the spooky and intriguing mood, and I liked the fact that the romance had a relatively slow build for a YA fantasy/romance. Sybella, the central character of Dark Triumph appears in the background of the events of the first book. The impression of her in Grave Mercy is that she’s troubled and volatile, possibly insane. 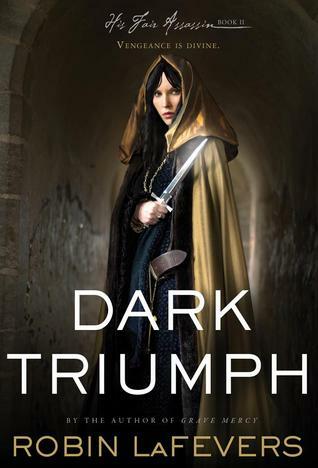 When Dark Triumph begins, and you begin to piece together Sybella’s background, and the way she grew up in a family full of violence and manipulative vicious power plays… you start to wonder why she isn’t even crazier. While going to the convent and being trained to serve St. Mortain took her away and gave her some power/hope for revenge… now, she’s back at home in d’Albret’s court, having to fend off the people who nearly drove her to madness in the first place, serving as an undercover agent, sworn to kill only when she sees the god’s mark on her victim. So much of her telling her story is a sense of thwarted revenge. No mark on d’Albret, or any of the others who clearly need a good killing. (Ahem. I may have gotten invested in the characters.) Instead, Sybella needs to rescue the knight known only as the Beast, who has been gravely wounded, and is languishing in d’Albret’s dungeon. I think this is an even stronger novel than the first. Having cleared up all of the mythology and worldbuilding in the first book factors into that. But, more to the point, Sybella makes a really interesting point of view character- damaged by her circumstances, in pain, and slow to trust, for good reason. Slow to trust other people, and also facing interesting crises of faith and purpose. I like her set against the wounded and recovering Beast- yes, there’s a romance (saying this feels less like a spoiler in both cases than it does a genre expectation) but I found this romance more believable, because I saw what the two characters had to overcome in themselves to reach out and connect with each other. Sophisticated emotional build for a YA fantasy. There’s a third volume slated for next year. I will definitely be looking for it.